I discovered the novel Delicious! by Ruth Reichl through an Amazon recommendation awhile ago and just knew it would make the cut for my summer reading list. Plus, since I had fallen out of the habit of reading lately, for my first book of the summer, I knew I wanted a work of fiction that I would devour in a couple of days. Having started Monday afternoon and finished Wednesday evening, this book was perfect. I love being captivated by a good story. I downloaded the eBook from the 3M Cloud Library, which I accessed through my library system. I read it on my Kindle. Although, since the main character's close friend uses wonderful old-fashioned formal diction, the Kindle version would be ideal because you can tap a word and receive the definition automatically. Not that it is difficult. In fact, I didn't Google a single word because I either knew each one or could figure it out in context. The free format was better for me. This is a story of a college-aged woman named Billie who lands a job at a food magazine in New York City, far away from home and school in California. She has a gift in her amazing palate. With one taste, she can name all the ingredients in a dish, even uncommon ones! She can also easily recommend what ingredient the dish needs or needs more of in order for it to improve. Despite this talent, Billie does not cook. This is just one of many ways that she holds herself back, mainly due to family issues. I adore her colorful friends, Italian ones included, who help her create a new life. The long-running magazine shuts down, but she is the only employee allowed to stay in order to deal with warranty issues. In her grand workplace, she and a former colleague discover hidden scattered letters from a twelve-year old girl who enjoys cooking to famous chef James Beard during World War II. This included history enriches the story. All of this leads her to a few more adventures, love, and healing. I love how she blossoms. Such growth. There are a lot of life lessons for the reader. I highly recommend this book. This is my 599th post. I am dedicating my next one (the 600th!) to answering your questions, so if you have a question, please ask me in the comment section or on any of the blog's social media. I normally post about a simple pleasure or signature item every Sunday, but I will break that tradition just this once. Instead, I will work on drafting detailed answers tomorrow. Since I've had so many wonderful inquiries over the last day, I'm unsure when you may expect the Q&A post to go live. Probably sometime next week. Thank you so much for your questions! 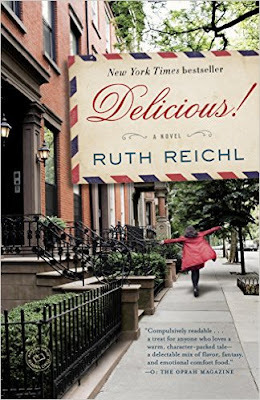 I read Ruth Reichl's memoir 'Garlic and Sapphires' and loved it, but have not read Delicious. It sounds wonderful; thanks for the descriptive review. Can't wait for the next post! I may have to read one of her memoirs... You're welcome! I'm happy to do something nice for my readers on the occasion of my 600th post. This sounds like a great book! I have yet to figure out how to get an ebook from my library. I tried once and it was confusing, but that was a few years ago and I'd like to give it another go. I will! I am starting to feel like myself again and worked on my next post for a couple of hours today. I will publish it sometime this week. I truly appreciate your comment. Yes....where are you? Miss your posts. Life has been rough and the break was unintentional. I miss posting for you guys. Thank you for your patience. I discovered your blog recently and really enjoy it greatly. I hope you continue posting. Benvenuto! Grazie! I will. Expect my next post sometime this week. It'll be a big one too! Hi Ping! I love the DITL videos on the YouTube channel How Jen Does it, so I have been toying with the ideas of posting a lot of pictures of my day. I'm glad to know it is what readers want as well. Since I am work to live, I am thinking of showing one of my weekend days. My blog's anniversary is in August, maybe that'll be a good post to celebrate the occasion... It's not nosy. I think it fits with a lifestyle blog. I'll definitely think about it. Hugs to you and looking forward to your return!! Hope you're doing better, looking forward to seeing you post again! Where are you, Michelle????? Missing you!!!!!! !